To hide the limited Field of View of a Mixed Reality headset like the HoloLens or the Magic Leap you can fade out the holograms at the border of the view. I will discuss three possible techniques with different advantages and disadvantages. 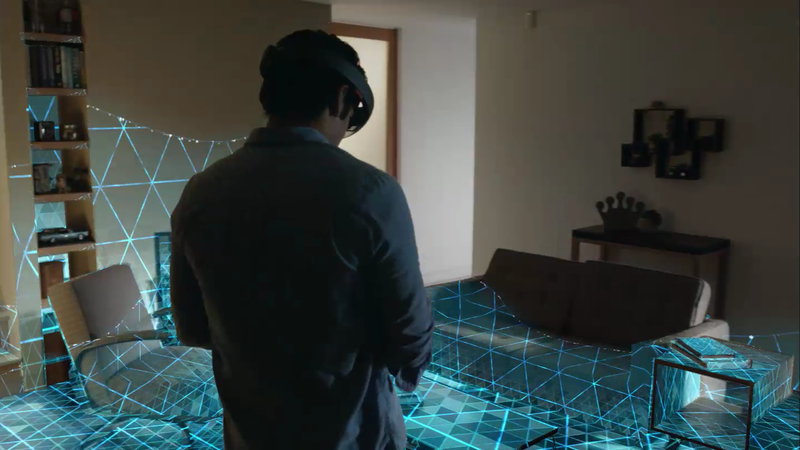 Note that all techniques have the same visual result in the HoloLens. However when recorded with Mixed Reality Capture the border effect seems to largely fall outside of the MRC camera field of view. The most modern solution is applying a post-processing effect. Post-processing effects in Unity can be a heavy hit on fillrate so that is why Microsoft advises not to use them on HoloLens. 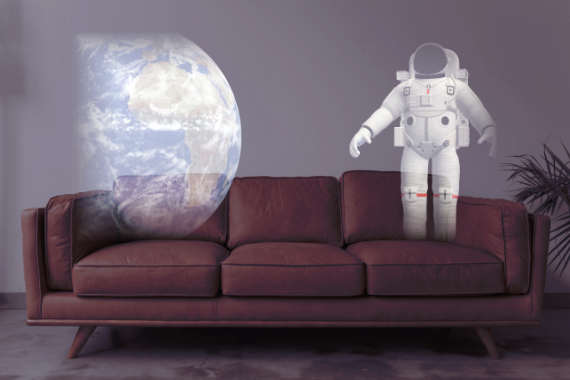 The Magic Leap has a bit more graphics power to spend so it may be a viable solution on that device. 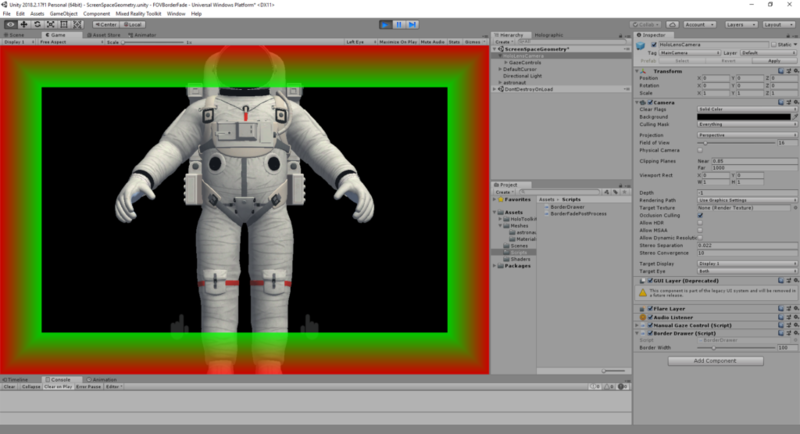 Typically a post-processing effect works by rendering the scene to a texture and then rerender that texture on a screen-aligned quad with a filter effect (e.g. grayscale, bloom, vignette etc.) applied during that rerender. This can be done multiple times in succession, but since each rerender also means modifying each screen pixel this will cost you fillrate. The biggest advantage of using this technique is that it doesn’t require changes to the content of your scene. But it may be a bit overkill for only add a fading border. Another solution is to let the material/shader do the fading out. 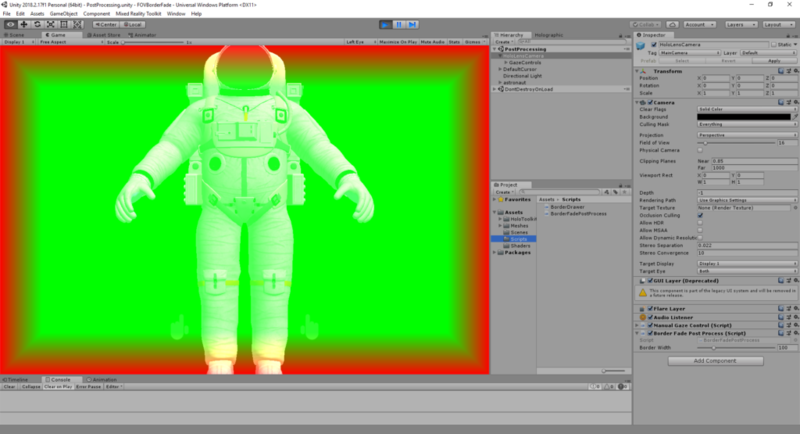 The used shader needs to calculate the screen position and then fade out the material when at the edge of the screen. Each hologram in the scene needs to have a material applied with this edge fading in it’s shader. 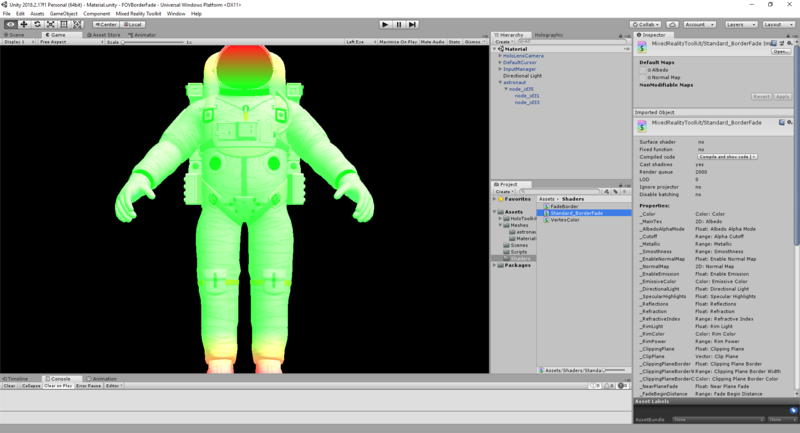 Modifying the used shaders may result in an improved performance, but this highly depends on what is visible in your scene. No separate postprocessing render is needed, but each shader uses a few more instructions and it requires all shaders in your scene to be modified. See GitHub project link for the source code of the Standard_BorderFade shader. It’s a modification of the Standard shader from the Holotoolkit. The third solution is rendering a screen aligned border that fades from transparent block to opaque black. It may sound a bit old skool, but it does the job with minimal performance impact and no need to modify the content of your scene. In a previous blog post I talked about my attempt to rebuild the HoloLens scanning effect as shown in this video. After following the HoloLens Academy tutorials I decided to see how easy my existing shader could be integrated in Unity. It turned out that only a minimal amount of plumbing was needed. I took the project files from the HoloLens course on spatial mapping (Holograms 230). That course explains how you can apply your own material and a custom shader to the mesh that is generated by the spatial mapper. For quick iterations you can even load a previously saved room mesh. I added a new unlit shader and a material using it. 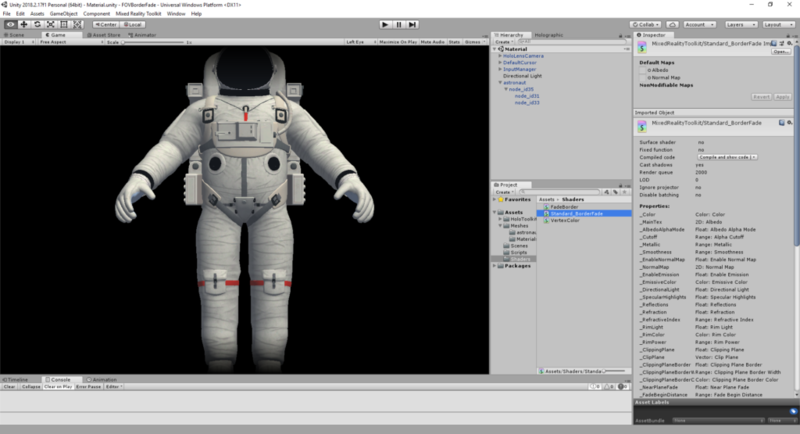 This material is used by the Spatial Mapping Manager script to apply to the mesh coming from the spatial mapper. Most of the plumbing came down to defining variables and using them in the shader. The main animation is driven by the global time. Unity provides this as a built-in variable vector _Time, where the y-component contains the elapsed time in seconds. I added a few variables to control the looks and behavior of the effect like Main Color, Speed, Triangles Scale and Range Scale. The center of the effect is also a variable that can be configured. It could be updated by using doing a Raycast intersection as explained in the HoloLens Academy tutorials. Currently the effect keeps pulsating every 5 seconds. To only trigger the effect on an event the used global time could be replaced by a separately controlled progress variable. To create the effect of triangles walking across the floor and up the walls the shader needs to calculate uv coordinates based on a world location. Preferably with as little seams as possible. I used the horizontal distance to the configured center point and added the vertical distance instead of using the direct distance to the center point. This works reasonably well on connected surfaces, but note that it is not a real walk across the topology of the mesh. The effect in the original video has a slightly different border effect that has some more distortions and a different color. I experimented with mimicking that effect, but decided to leave that out. I used the effect in an interactive installation where I preferred a stronger border that looked like a wave was expanding outwards. The source code of the project is available on Github. A new version of this shader was optimized for running on the actual HoloLens device. This shader and many others are available in the HoloLens Shader Pack that is available on the Unity Asset Store.